Welcome to the Michelson Diagnostics web page for North America. Michelson Diagnostics manufactures and sells VivoSight™ – an Optical Coherence Tomography (OCT) imaging system. Dermatologists can use VivoSight™ to visualise the subsurface of the skin, and may use this view to assist in their assessment of a patient. 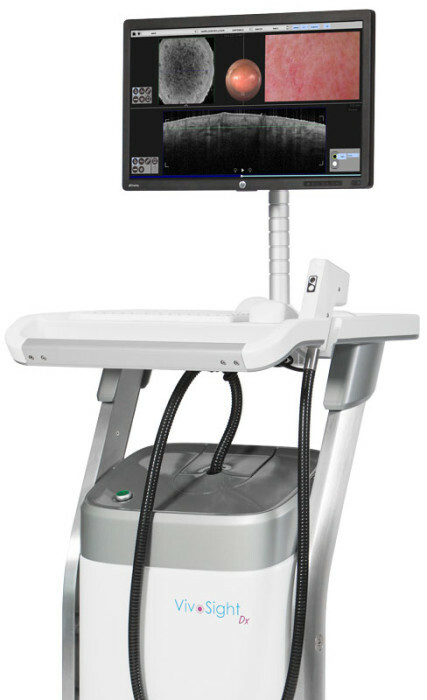 A VivoSight™ OCT scan is wholly non-invasive and painless for the patient and routine use of the system can easily be integrated in clinical workflow. More than 50 clinical publications have evaluated the clinical utility of the VivoSight OCT system in a variety of clinical settings and across a number of clinical applications. Most recently, the VivoSight™ was used in a multi-centre clinical study published in the British Journal of Dermatology. You can visit their site where the full paper can be accessed and downloaded. US Federal law restricts this device to sale by or on the order of a physician. VivoSight is cleared under 510(k) number K153283. The VivoSight™ Topical OCT system is indicated for use in the two-dimensional, cross-sectional, real-time imaging of external tissues of the human body. This indicated use allows imaging of tissue microstructure, including skin, to aid trained and competent clinicians in their assessment of a patient’s clinical conditions. The VivoSight™ Topical OCT system is not currently cleared for sale in Canada.